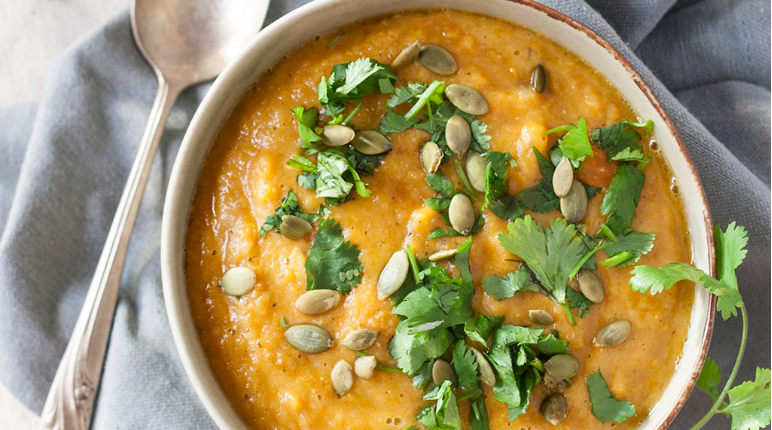 This sweet and savory soup is a crowd pleaser and a great way to enjoy the season’s bounty of squash. Beyond its delicious flavor, a serving of butternut squash soup also provides more than 400% of your daily requirements of Vitamin A, which promotes healthy skin and immune function. It also contains the minerals magnesium and potassium which support muscle health. 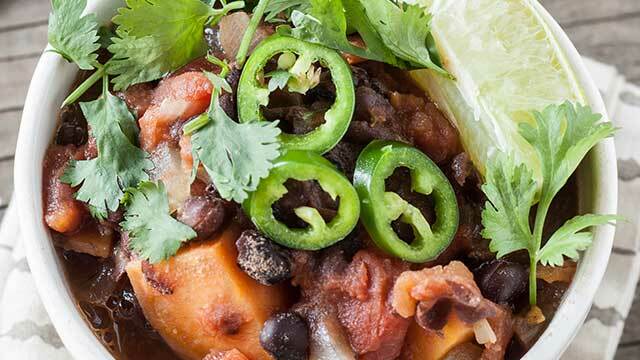 Recipe courtesy of Andrea Bemis, chef/writer of Dishing Up The Dirt and owner of Tumbleweed Farm, in Hood River, OR. Heat coconut oil in a large soup pot over medium-high heat. Add the onion and cook until tender and fragrant, about 5 minutes. Stir in the garlic, ginger, and butternut squash. Continue to cook for about 3 to 5 more minutes, stirring often. Add the curry powder, peanut butter, salt, pepper, and vegetable broth. Bring to a boil. Reduce heat and simmer until squash is tender, about 25 minutes. Carefully puree the soup with an immersion blender OR puree the soup in a regular blender, working in batches. Stir in the coconut milk. If soup is too thick, add additional stock or water. 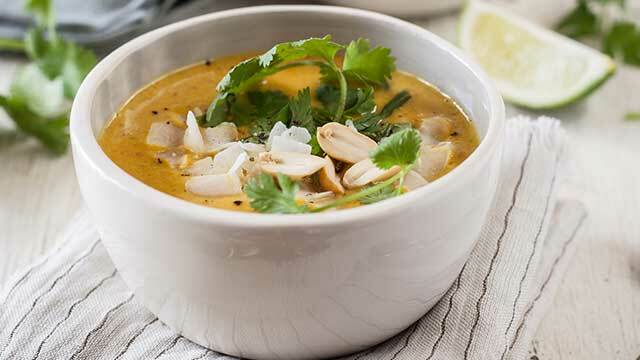 Divide the soup between bowls and add fresh-squeezed lime juice. Serve with minced cilantro, peanuts, and coconut flakes. This tastes amazing! I agree with Margaret that it could take some spice and be even yummier. Next time I might add some curry-like ingredients (rice, chopped veggies, maybe meat) for my hubby who likes something a little more substantial. Really great. My 14 year old son, who is always making fun of me for being too “kale chippy,” couldn’t believe this was vegan. He ate two bowls after school! Loved this soup. I was possibly even more excited to eat it for lunch the next day because I knew what was waiting for me. I used almond butter instead of peanut bc I had it on hand. Had to play around with the spices (for me, mild curry powder, chili powder, and lime juice) to get it just right. And if you live near a Trader Joe’s, they sell pre-cut butternut squash. So warm and filling! I thought this was one of the best recipes on here. I served it for a dinner party and everyone finished all of it. The only thing I’ll do different next time is to make it a bit spicier – wondering what the best spice/pepper would be, any thoughts? This is simmering on the stove now! Despite my trepidation at having to prep the squash, this is a really easy recipe to make. I cut the four main ingredients (squash, onion, ginger, garlic) earlier in the day and kept them in the fridge until go time this evening. Looking forward to tasting this one!